The Land Rover Discovery Sport replaces the old Freelander to start a new family of Discovery-badged models. Instead of the Freelander’s five seats, the Discovery Sport has seven. We’re testing the high-spec HSE model with a 2.2-litre SD4 diesel and an automatic gearbox. At the time of writing we were just a few weeks away from this engine being replaced by a new unit promising better refinement and fuel efficiency. We tested the Discovery Sport at the 2015 Tow Car Awards, so we know it’s good. Will our respect for the Sport grow after spending longer behind the wheel? Is the new car practical enough to deserve the Discovery name? The Discovery Sport’s facts and figures speak of a car ready for serious towing. A kerbweight of 1863kg is quite high for a mid-sized SUV, which gives a healthy 85% match figure of 1584kg. We’d never recommend towing a caravan weighing more than the kerbweight of the tow car, even to an experienced driver, but the 2200kg legal maximum is reassuringly high. The towball limit is 100kg. We hitched up to a 2015 Swift Challenger SE 645 with a Mass in Running Order of 1526kg, an 82% match for the Discovery Sport. Some cars feel right when towing – and the Discovery Sport is one of them. Even while pulling a big, twin-axle tourer, the Land Rover was relaxed, secure and strong. Once out on the motorway, nothing changed that strong impression. If anything, the car felt better than at the Tow Car Awards. In some ways, that’s no surprise; for the Awards, it towed a single-axle caravan without a stabiliser, but for this test it pulled a twin-axle tourer with a stabiliser. With the extra axle and help from the hitch, the Discovery Sport felt immovable at the legal limit, without the slight movement in crosswinds we noted during Tow Car Awards testing. At the test track, we pushed the Discovery Sport hard in our lane-change test. Again, the Land Rover impressed with good grip and a willingness to change direction in a hurry. We felt some shoving from the van as we steadily increased speed, but the car remained firmly in charge. As well as being stable, the Discovery Sport is no slouch. Accelerating from 30-60mph took just 11.1 seconds. With no fewer than nine forward gears, the Discovery Sport’s automatic gearbox is rarely in the wrong ratio for long, changing smoothly and making the most of the engine’s 310lb ft of torque. Even with a hefty twin-axle caravan to pull, this engine and gearbox combination makes towing seem effortless. It pulls up steep hills easily, and quickly gets up to speed after being held up by slower traffic. Hill starts are easy with the Discovery Sport. 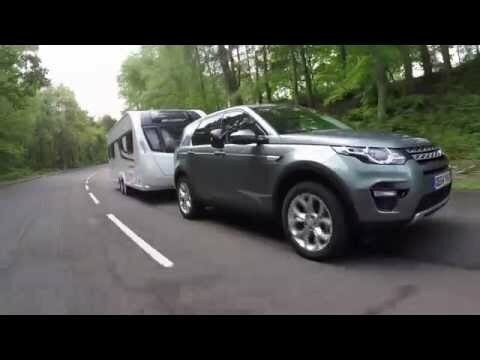 The electronic parking brake holds car and caravan still, even on a 1-in-6 slope, while the four-wheel drive, a powerful engine and an automatic gearbox get the Land Rover moving. The Discovery Sport’s brakes were also impressive, needing just 10.5m to stop the outfit from 30mph. We were pleased by the lack of shunting from the caravan. For an emergency manoeuvre, the stop was reassuringly undramatic. With stability, speed and strong brakes in its favour, the Discovery Sport is a very accomplished tow car. The Discovery Sport is also a fine car to drive every day. For one thing, it is nimbler than the Freelander. It leans more on turns than a BMW X3, but it’s a fun car to drive on a twisting road. The steering is precise without being nervous and the level of assistance is well judged. There’s just enough heft when cornering at speed, but plenty of help when parking. The Land Rover is at its best on open, flowing roads. The firmly controlled suspension that contributes to the car’s stability when towing controls the body over dips and crests. However, the ride is too firm at low speeds. The larger Disco smooths over lumps and bumps around town, but sharp imperfections in the road cause the Sport to fuss and fidget. Performance from the SD4 engine is strong. It’s not as quick as, say, a Porsche Macan diesel, but the Discovery Sport gathers speed with ease, so pay attention to the speedometer to avoid travelling faster than intended. However, the engine is showing its age in terms of refinement. Compared with BMW’s latest 2.0-litre diesel fitted to the X3 xDrive 20d, Land Rover’s venerable SD4 engine is clattery. Once up to speed, little engine noise intrudes, though. There’s some wind noise at the motorway limit, but the cabin is hushed enough to make this a pleasant long-distance car. Engine refinement and low-speed ride aside, the Land Rover drives very well. This is where the Discovery Sport really scores over its rivals. The cabin is extremely spacious and full of clever ideas. Many rivals offer just five seats, but the Land Rover has seven. Thanks to ingenious packaging, a third row of seats has been fitted without making the Discovery Sport awkwardly long. In fact, it’s shorter than the five-seat Audi Q5 and BMW X3. At the front, the driver and passenger will find bags of space and a wide range of adjustment for the seat and wheel. The driver sits up high and all-round visibility is good. Those in the second row have loads of space; a six-footer can sit behind an equally tall driver with room to stretch. The cabin is wide and by 4x4 standards the transmission tunnel is fairly small, so three people can sit on the middle bench in comfort. The second row can be reclined for a quick nap, and slides back and forth on runners. It’s a useful feature, which allows those in the middle to trade some legroom to make more space for bags. If the third row of seats is in use, sliding the bench forward gives those in seats six and seven more legroom. You need to be fairly nimble to get to the third row, but if those seated in front of you don’t mind compromising a bit, there’s enough room for adults on short trips. It’s good to see Land Rover has remembered air vents and cupholders for those in the third row, too. With all seven seats upright, there’s little boot space, but then Land Rover describes the Discovery Sport as a ‘5+2’, and expects most owners to leave the third row folded away most of the time. With the rearmost seats stowed there’s a healthy 830 litres to fill, and if you fold the second row as well there’s a generous 1698-litre capacity. If we have a criticism of the cabin, it’s that some of the plastics lower down the dash and on the transmission tunnel feel a bit too workmanlike for a £40,000 car. Nevertheless, as a practical family SUV, the Discovery Sport is superb. The thick end of £40,000 is a serious amount of money to pay for a car that in this guise is being replaced in September. In reality, walk into a Land Rover dealership tomorrow to buy a new Discovery Sport and you’ll be shopping for a car with one of the new Ingenium engines. Anyone buying an SD4 may get an ex-demonstrator or a nearly new car. Choose the SD4 for 187bhp and 44.8mpg with the automatic gearbox. Even the more powerful (178bhp) of the two Ingenium engines has less power than the SD4, but fuel economy improves to 53.3mpg, and it will cost less in Vehicle Excise Duty. Colleagues who have driven the Ingenium engines in the Jaguar XE have been impressed with their refinement, so expect less noise from under the bonnet, as well as improved fuel economy and lower emissions. Although the Ingenium cars should be better, we’ve no complaints about the Discovery Sport’s economy when towing, having achieved 27.6mpg on a route of A-roads and motorways. Resale values of 55% are very healthy indeed, although we’d be surprised if the Ingenium models didn’t improve on that by a few percentage points. Those strong used values make the current car a sound buy, but every indication is that the Ingenium will be better. So, if you're wondering what tow car to buy next, could the Land Rover Discovery Sport be what you're looking for? It is close to brilliance. It’s held back mostly by the poor refinement and high emissions from the engine, and the knowledge that an improved version of the same car is about to arrive in showrooms. As a tow car, it’s one of the best mid-sized 4x4s. At speed it’s very stable, and it performs well in emergency manoeuvres, too. The engine may not be the quietest, but it pulls strongly and copes easily with a caravan weighing more than 1.5 tonnes. Hill starts are straightforward, and powerful brakes make for safe stopping. In daily driving, the Discovery Sport is a more entertaining car than the old Freelander. However, the ride at low speeds isn’t as supple as we’ve come to expect from Land Rover. Perhaps the Discovery Sport’s greatest strength is the cabin. Most prestige-badge rivals have five seats, while the Discovery Sport has seven. Land Rover describes the car as a 5+2, but the third row is roomy enough for adults. The sliding middle bench helps, and those in the second row have space to spare. Folding down the second and third rows is a quick and easy job, and leaves a very generous loading area. The trouble is, however good the Discovery Sport is now, it’s impossible to forget that a new and improved version is on its way. The Ingenium engines should address the car’s refinement and economy shortcomings. That could turn one of the best mid-sized 4x4s into a clear class-leader.